Local and federal officials said Saturday that progress is being made in Puerto Rico to restore water, gasoline and communications to the hurricane-battered island, as President Donald Trump railed on Twitter against "fake news" and defended recovery efforts. Only five percent of the island has electricity service as of Saturday, 10 days after Hurricane Maria made landfall as a strong Category 4 storm, wrecking infrastructure and communications on the U.S. territory, according to the Federal Emergency Management Agency. "This was a catastrophic storm. We're making progress every day," FEMA acting regional administrator for region II John Rabin told reporters Saturday. 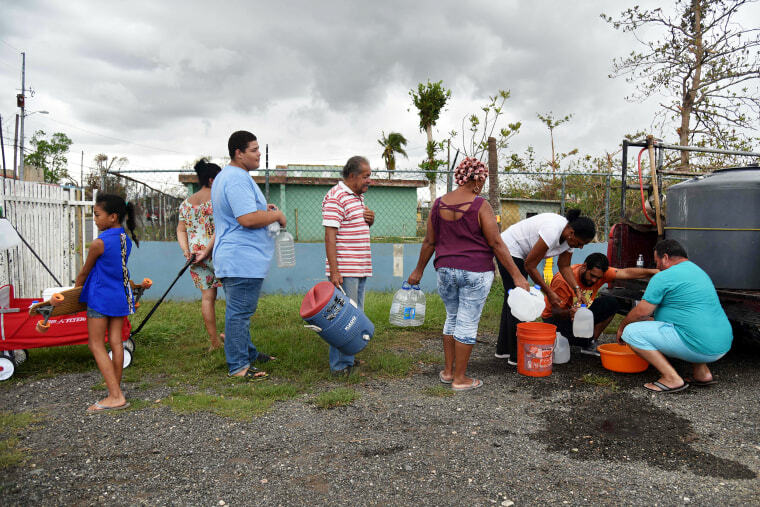 Puerto Rico’s Aqueducts and Sewers Authority reported that 47 percent of its clients now have water service, according to the governor’s office. "Today will be a little bit better than yesterday. Tomorrow will hopefully be a bit better than today was," Rabin said. The governor's office said cellular service has been restored to 33 percent of the island's customers by Saturday. Rabin said that on Saturday a barge carrying more than 2 million meals and around a million-and-a-half liters of water was being delivered and "and this is one delivery that is constantly coming on a regular basis." But in perhaps Trump’s most controversial tweet Saturday, the president rebuked San Juan Mayor Carmen Yulín Cruz's criticism of what she described as a recovery effort slowed by inefficiency and bureaucracy. "Such poor leadership ability by the Mayor of San Juan, and others in Puerto Rico, who are not able to get their workers to help," Trump tweeted Saturday morning. "They want everything to be done for them when it should be a community effort. 10,000 Federal workers now on Island doing a fantastic job." "Hamilton" creator Lin-Manuel Miranda was among those expressing outrage at the comments, Tweeting: "Did you tweet this one from the first hole, 18th hole, or the club? Anyway, it's a lie. You're a congenital liar." In San Juan, Puerto Rico’s largest city, residents waited hours for supplies Saturday. "You take what you can get," resident Katurah Kersting said. Shop aisles were observed to be lined with empty shelves. Dry goods like rice and beans were being rationed. Power and communication problems meant all transactions were being done in cash only. "Most people, they’ll have to make long lines at ATM and banks. Most banks are working with diesel generators and they can only go on as long as they burn through that, or until they run out of cash," William Huayamave of San Juan said. FEMA said Saturday that more than 60 percent of Puerto Rico's gas stations were in service, and that as of Thursday nearly half of grocery stores were operating. FEMA said it had 11 regional staging areas to receive food and water. Trump said he will visit Puerto Rico on Tuesday. "Our priorities at this juncture keep being food delivery, delivery of gas, making sure that the hospitals are working, making sure we can get more hospitals on line, that they get their diesel and their fuel," Puerto Rico Gov. Ricardo Rosselló Nevares said Saturday. NBC News saw few trucks leaving the port of San Juan on Saturday. Francisco Corrada, manager of freight services at Crowley Maritime Corporation at the port, said things are picking up but if businesses are not reopened they can't send truckers to pick up goods. "Obviously, I imagine it's not a lack of truckers situation, it's a lack that the business gets started so they can send the truckers to pick up the cargo," Corrada said. More than 200 loads from FEMA arrived Saturday, and "by 11 o’clock in the morning we already dispatched 60 of them," he said. He said more were expected to be dispatched in the afternoon. At least 18 people are believed to have died in Puerto Rico in the storm and in its aftermath, officials said. At least 27 died in the Caribbean island of Dominica, according to the Caribbean Disaster Emergency Management Agency, and one death was reported in Guadeloupe. Gabriel Aguado, 16, and his mother drove 90 minutes to San Juan to buy food. "We got cereal, bread, and some things to make tacos because [it's] the only thing we can like do right now to eat," he said, adding they don't have much gas, and no power. "I think we're great, for us, but I saw families that doesn't have much, eating from the garbage and stuff," Aguado said. "Drinking from ... the gutters. And it's really hard."